A longer and rather more colourful description of the British Museum's non-invasive examination of an 800BC mummy - this time from the Telegraph. See full online article for more. Cairo Museum are requesting the return of the famous Nefertiti bust for a several month exhibition. The museum has a massive collection on display, and the additional collection is stored in the basement. "But that too is crammed to the brim. Objects there are stored so haphazardly that many cannot be located, and some may even have gone missing. It has been reported that an important relief has been mislaid and 38 gold bracelets and rings have disappeared. This mayhem in the basement has pushed the Ministry of Culture to launch an ambitious three-year plan to protect the legendary storehouse" (Al Ahram Weekly). After being wrapped, Late Dynastic mummies were encased in "papyrus-mache" - coverings made of recycled papyrus texts. The University of California-Berkeley has a collection of these which is the least mined of these resources to date, and these are now being explored. "Journalists and photographers gathered at the elegant Ministry of Culture edifice last Tuesday to witness the official nod to the long-awaited National Museum of Egyptian Civilisation, planned to display the span of Egypt's various civilisations. Built at the edge of Lake Ain Al-Sira on the site of the mediaeval city of Fustat, the ambitious museum will put on show Egypt's diverse civilisations from pre-historic to modern times. On display will be 150,000 artefacts carefully selected from museums and storehouses throughout Egypt" (Al Ahram Weekly). "Researchers used an increasingly popular method called a genetic clock, in which genetic mutations can be calculated for each generation, and then generations of two separate species can be counted back to a theoretical common ancestor". "African wild asses were probably tamed not once, but twice, in locations far apart to become the willing donkeys that carry loads the world over, an international team of researchers says." In Egypt the earliest donkey remains date back to the early Neolithic of Lower Egypt. This article gives information about what archaeologists are learning about a cross section of society and the people who were buried at the site. A good, informative piece. N.B. - you have to register with this site, and it will ask you for an email address and password when you revisit. It is an article about an American visiting Egypt, the security precautions in place and the absence of Americans. 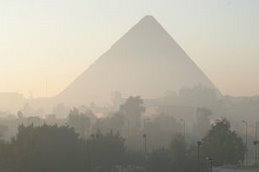 The article is a mixture of anecdotal accounts of the writer's visit to Egypt and some contemplation about why, in her opinion, Americans have ceased to visit. Dr Christiana Kohler's Australian Mission has found a necropolis at Helwan containing a relief showing early hieroglyphic text and 20 tombs. The necropolis also has two early Old Kingdom tombs. The Mortuary Temple of Seti I has been restored and re-opened. This article describes Seti I and his role in Egypt's history, putting his mortuary temple into context. It touches on Seti's son Ramesses II and discusses the possibility that the Ramesseum was originally built for Seti rather than his son. More Ptolemaic finds have been located including more blocks of the famous lighthouse, more pieces of the rose granite statue of Isis, and a stela describing a Ptolomaic tax law. "CAIRO (Reuters) - Egypt is about to begin the painstaking five-year task of cataloguing and restoring some 90,000 pharaonic and other artifacts which have lain almost forgotten for decades since they were dug from ancient ruins"
A number of items in the Cairo Museum cannot be accounted for, and an audit is going to be carried out to discover the full extent of the loss. It is alledged that 38 gold items from the Tutankhamun collection are missing, and it has been confirmed that another 38 pieces, dating to the Roman occupation of Egypt, are also missing. This PDF file provides a 10-page overview of the Czech excavations at Abusir in the 2003-2004 season. The paper includes plans and photographs. The description of the excavations is short but fascinating, and a real insight into the Czech activities at Abusir. Zahi Hawass discusses the evidence of Egiptomania in the culture of Dubai. The first issue of "The African Scientist - Bringing Genomes Alive". It dates to January of this year, but I've only just found it. It has a two page article entitled "Where do Africa's cattle come from?" which is an important topic for prehistoric/predynastic studies and the origins of Egyptian domestication and agriculture. Boston's Museum of Fine Art has acquired a remarkable piece of statuary known as "The Nobleman" for its collections, and it is now on display. Showing a man's head, it is thought to date to the reign of Senusret III. It has belonged for many years to the Josephson private collection, and this detailed page describes both the sculpture and the way in which it was acquired and kept by Josephson. I haven't so far found a picture of it online, and the MFA website is out of date on the news front, but I'll update as and when I find one. There are five articles in the EEF Library, and a new one has been added by William McMurray entitled "Towards an Absolute Chronology for Ancient Egypt". McMurray invites comments via the EEF forum.